I haven't paid much attention to anything that Deep Elm has put out since Emo Diaries Volume #5. I always thought this label's marketing of the term "emo" was cheeky as they pawned off any band that had black-rimmed glasses as the next poster boys for shy teenage girls to adorn their room with. Then I heard a buzz floating around about a new Deep Elm signing by the name of Latterman and how much they brought the rock. People were telling me personally how not only did they bring the aforementioned rock but how much I would be into them. I was a bit apprehensive of course. Seriously, a good band on Deep Elm these days; say it ain't so? I had a hard time swallowing that pill since I haven't truly loved anything on Deep Elm since they released that Planes Mistaken for Stars EP way back in the day. On St. Patrick's Day of this year, Latterman was scheduled to grace the stage of the Triple Rock with The Lawrence Arms and The Blackout Pact. I, not being Irish and not much of a drinker, decided I would go check out this all-ages surrey. I called a girl that'd been begging me to hang out and I told her that we should go to this show. She opted to drive and I told her to not be late because I wanted to see the opener, Latterman. She promised me we wouldn't miss them, but of course she was late. Very late. Half way into The Blackout Pact's set late. Curses, foiled again to hear a band that everyone else in the world was hearing and everyone else was telling me how much I would like this damn Deep Elm band. Stupid girls. In another strange twist of fate, ...We are Still Alive was sent to my mailbox and I sighed in relief. I was finally going to hear what all the buzz of Latterman was about and how they would be my saving grace for Deep Elm Records. I darkened my room, set the CD into my Sony boom box, pushed played, and was ready for my music salvation. The first thing that popped in my head after listening to ...We are Still Alive was why wasn't this put out on No Idea. Latterman sounds the equal parts of the most melodic side of Hot Water Music compiled with the most rocking side of Small Brown Bike. Latterman completely fit the genre of gruff dual vocal mid-tempo melodious dirty sweaty bearded punk bands that No Idea has been hawking for almost a decade. The second thing that ran through my skull was that I liked what I was hearing. Wonders never cease. Latterman are quite apt at playing "beardcore" as the kids like to call it these days. Quite frankly, Latterman are really good at it. I found myself in no time singing along to various tracks on ...We are Still Alive, especially the fist pumping friendship anthem "If Batman was Real, He Would Have Beaten the Crap out of My Friends." 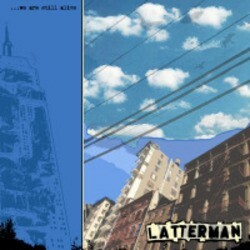 So after many trials and tribulations I finally heard Latterman. And yes, people were right, I do like Latterman. Who wouldn't like a catchy punk rock band that has their hearts on their collective sleeves? I'm sure their shows are an imitate affair with kids shouting their throats raw as they clap and sing along. Everyone goes home sweat-clad and smiling. What more can I ask from a band these days? Posted Sept. 19, 2006, 3:12 p.m.
Posted Aug. 1, 2015, 10:47 a.m.